Yahoo! has launched Yahoo social news site Buzz in the India, which identifies the top news stories and blog posts based on user votes and search patterns. India thus becomes the first country outside of the United States to receive a customized Yahoo Buzz portal. Yahoo! 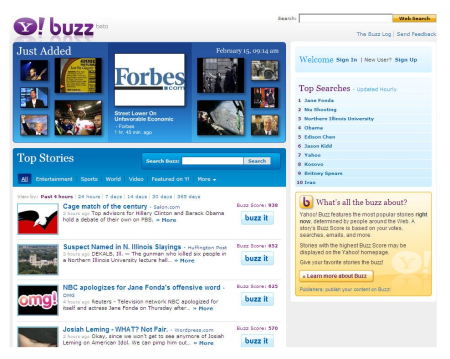 Buzz is a community-based news article website; Yahoo! Buzz is Digg-like service that allows discovering, submitting, commenting on news stories and even voting for the most liked ones. “Yahoo! Buzz is a great example of how we can combine popular stories with the wisdom of real people to determine what is most engaging and relevant to our millions of users,” said Yahoo! India Head of Audience Frazier Miller. In order to use Buzz, users have to login with their Yahoo account and “Buzz up” the stories or news that are of major interest to them. If a majority of users approves that news, then that story hits the headline page on Buzz. Users can allow publishing their own news stories, and link to their own or another person’s site that links to a full story of the information. Yahoo users can also comment and discuss the stories, search for news, filter using 10 categories of stories and subscribe to the RSS Feed. Yahoo Buzz in India already features content from over two dozen local publishers. Online publishers can place a Yahoo Buzz button on their Web pages to enable readers to share and vote on stories. Yahoo! Buzz in India already looks busy with major content news channels like NDTV, Zee News, India Today Group and the Times of India being featured on it.